Ladies and gentlemen welcome to your protein charged breakfast, featuring fiber, iron, magnesium, riboflavin, and manganese! 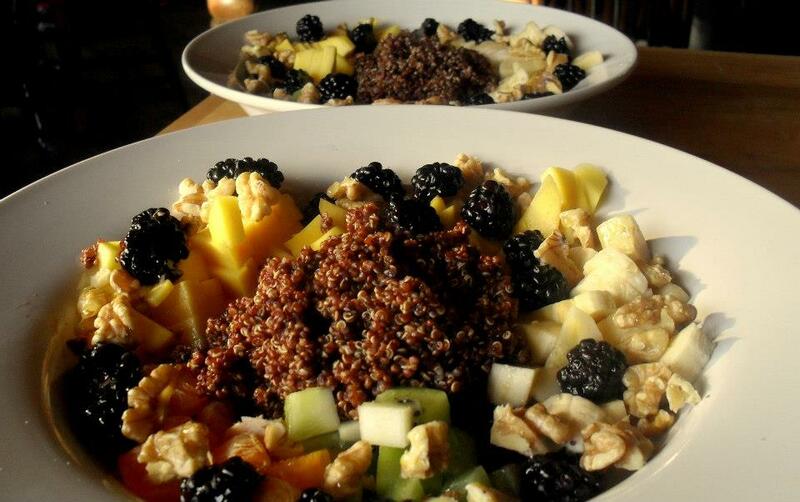 Back in the days Incas believed that quinoa increased warrior’s mental and physical power. Wash quinoa in several changes of water in a bowl, rubbing grains and letting them settle before pouring off water (if quinoa does not settle, drain in a large fine-mesh sieve after each rinse), until water is clear. Drain washed quinoa well in a large fine-mesh sieve. Combine all ingredients in a heavy medium saucepan and bring to a boil, covered. Reduce heat to low and cook, covered, until water is absorbed and quinoa is tender, about 20 minutes. Remove pan from heat and let stand, covered, 5 minutes. Fluff with a fork and keep covered to keep warm. Remove cinnamon sticks. Serve and top with walnuts, maple syrup or honey, almond milk or fruits of choice.